The 2017 Corvette Grand Sport is the Corvette to own, but you’re “only” working with that 460 horsepower 6.2-liter LT1 V8. This means, on paper, the Hellcat twins have you beat with their stupidly-powerful 707 horsepower outputs, at least until now. Sure, you could go for the Corvette Z06, which boasts 650 horsepower, but you still don’t have those Cars & Coffee bragging rights over the guy that shows up in his Dodge family sedan with some kitty stickers, attracting all of the 15 year-olds with cameras more expensive than a college education. That’s understandably annoying. But now, Specialty Vehicle Engineering just revealed its 800 horsepower, 750 lb-ft of torque Yenko 2017 Chevrolet Corvette. According to Automobile Magazine, the modified Corvette Grand Sport increases the displacement of the LT1 from 6.2 to 6.8 liters, which naturally comes with some new components. SVE also slapped on a 2.9 liter twin-scroll supercharger found on the Z06's LT4 engine, and you can get it with either the 8-speed automatic or the glorious 7-speed manual. 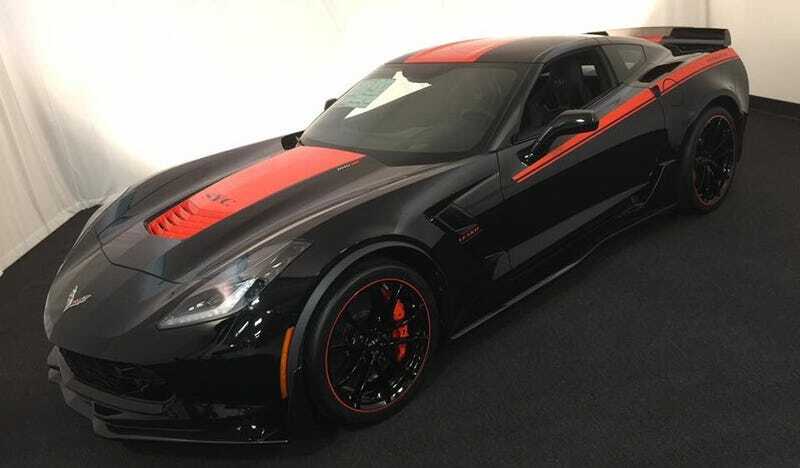 You can also get your Crazy Corvette in coupe or convertible form, but at the whopping cost of $46,000 on top of the base price of the Grand Sport, which Chevy’s website lists starting at $65,450. Only 50 will be built, with a public introduction for the car at the 2017 Barrett-Jackson Scottsdale sale. Also, you can’t own it in California due to the state’s emissions regulations. Whatever, you have 49 other states to show-up the Hellcat in. Maybe Joe Biden should pick this one up. For more pictures from the media event, head over to Automobile Magazine.